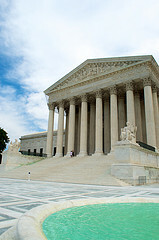 The Supreme Court has once again ruled that forced arbitration clauses in contracts are enforceable, and that they can be used to preempt class-action lawsuits, even in cases where class-action suits are the only economically feasible way for the plaintiff to make its case. Today’s ruling comes two years after the landmark Concepcion case, in which the Supremes held that tiny forced-arbitration clauses stuck into contracts customers often don’t read — and which the consumer has no ability to contest or alter — is sufficient to preempt class-action suits. The ruling in the American Express case not only reaffirms that ruling, but also gives companies the ability to use forced-arbitration clauses to effectively break the law, so long as it’s too expensive for consumers to prove it. The case before the Supremes was American Express v. Italian Colors Restaurant, in which a group of merchants claimed that the credit card company was violating antitrust law by forcing stores that accept AmEx charge cards to also accept the company’s credit and debit cards, for which the merchants say they pay higher rates than they do on competing credit cards and debit cards. AmEx’s contract with merchants contains a forced arbitration clause that includes a ban on merchants banding together in a class-action against the company. But the merchants in this case contend that the only way to prove their case was by sharing resources and filing a lawsuit as a class. If the merchants had each sought remedy through contractually mandated arbitration, they claim the costs for fighting AmEx would be too high — the price tag for a single market study needed for their case was $1 million — and the rewards too little, as arbitration puts relatively small caps on payouts. The merchants had tried to argue that there is an “effective vindication” exception in this case, in that the class-action waiver preempts the plaintiffs from pursuing Congressionally granted rights. However, the majority of the Supremes maintained that effective vindication exceptions are intended for cases in which the waiver takes away the rights of the plaintiff to seek statutory remedies. The mere fact that the cost of putting up a proper case would be higher than the value of any financial remedy does not mean the plaintiff doesn’t have the right to pursue its case, explained the majority. In her dissent, Justice Elena Kagan wrote that she does believe there such an exception does exist when it’s not simply a dispute between two parties, but when the plaintiff is alleging violations of the law. That proposed legislation (Here’s the House version, and here’s the Senate version) aim to reform the Arbitration Act to prevent companies from using forced-arbitration clauses to circumvent the legal system and compel customers and employees into an arbitration system that is heavily weighted in favor of large businesses. Previous 5 Foods Banned In Other Countries That We Chow Down On In The U.S.